As most of you already know, the Bardot trend has been around since the Regency and Victorian era. Yes, it is currently better known as the cold-shoulder/off-shoulder style, but it’s definitely not a new discovery. Off-shoulder dresses were extremely popular in the early to mid-1800s with prominent names like Eugénie Bonaparte, Napoleon’s empress, and her ladies donning creations designed by Charles Frederick Worth in 1855. The trend got the name ‘Bardot’ because of Brigitte Bardot, who added her own spin to it in the 1960s. 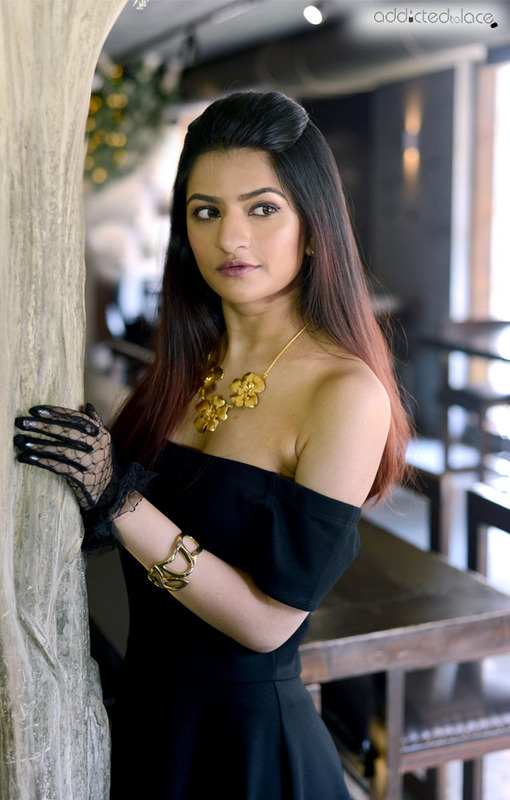 Today, the trend is incorporated into every possible look from casual to evening-wear, with off-the-shoulder crop tops, sundresses, formal dresses, and even lehenga and saree blouses being designed to highlight the décolletage. 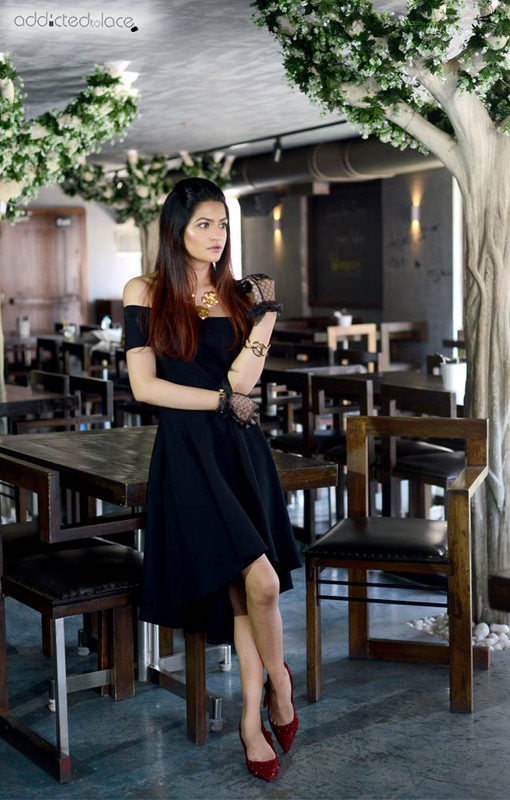 For this look, I decided to wear one of my favourite Bardot dresses and go the vintage route. For the makeup, the obvious choice was to draw inspiration from one of my icons, whose class and elegance is unmatched by any other. The goal was to recreate Audrey Hepburn’s subtle winged eyeliner and matte pink lips. Of course, a generous application of mascara was a key component too, further enhancing the retro feel. 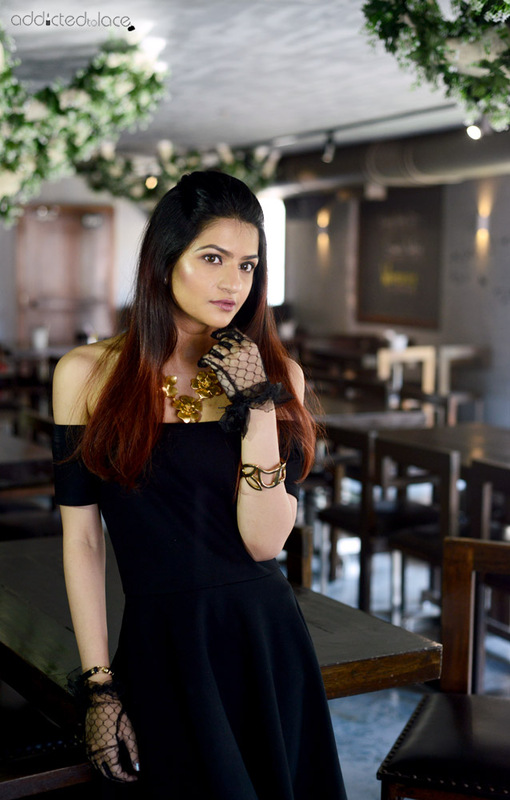 The best part about wearing the cold-shoulder style is that you can have fun with your jewellery. Opt for long, statement chandelier earrings or, like me, accessorize with a bib necklace. I chose to stick to tones of gold, matching my necklace with a cuff bracelet on one hand and a faux-leather magnetic one on the other. 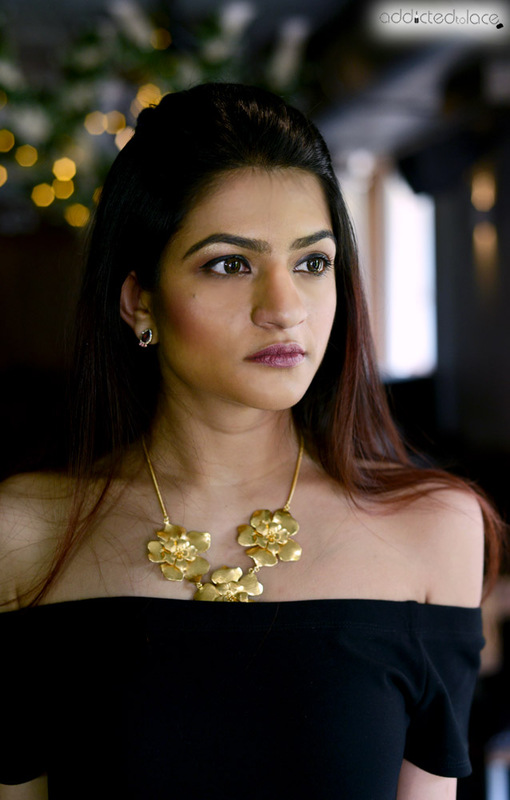 Stud earrings with gemstones helped balance out the look, drawing focus to the floral neckpiece. I was extremely stoked to wear these red glitter kitten heels. It slightly pushed the outfit into fairytale territory, adding a touch of whimsy to the elegant ensemble. I also wanted to add a hint of classical romance, which is why I threw on black lace gloves to complete the look. 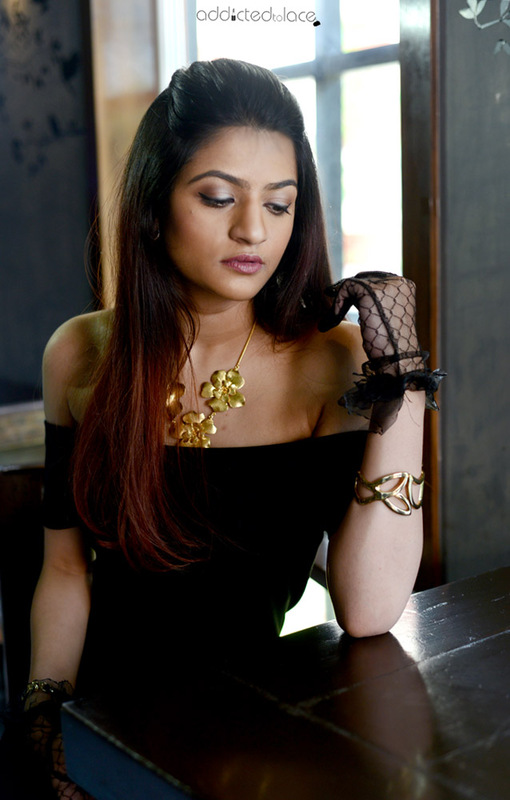 Gold Cuff Bracelet – Aldo, Black Lace Gloves – Lokandwala Market, Red Glitter Kitten Heels – Charles & Keith.